The CatGenie Self-Washing Self-Flushing Litter Box’s claim to fame is that it is the world’s only “self-washing” cat box. How does this feature differ from the usual self-cleaning litter boxes on the market? Well, there are several bells and whistles that the CatGenie comes equipped with that makes the self-washing feature among others stand out. Perhaps the most intriguing features is that the CatGenie uses its own patented washable granules instead of litter. Imagine never having to buy cat litter again! This feature alone should get the attention of any cat owner who dreams of saving money on their cat’s necessities, as well as saving time on stooping and scooping waste, and all that energy spent on lugging the often massive bags of litter home after purchasing. The CatGenie also proclaims itself to be dust, germ, and odor-free. It also automatically washes, sanitizes and dries itself. This is quite an impressive array of features that just about any cat owner would gladly pay handsomely for! Indeed, the CatGenie’s price tag is considerably higher than most other self-cleaning litter boxes on the market. But then again, given all these convenient features that the CatGenie claims to possess, the higher price seems like a worthy investment that would save money for any cat owner in the long-run, although you will have to buy new washable granules every few months. 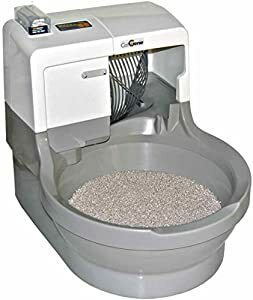 Okay, here is one of those cool features that the CatGenie prides itself in and that sets itself apart from other self-cleaning litter boxes. The CatGenie works as a sort of toilet for your cat (it’s even shaped like a traditional toilet), which means that it needs to be set up to a water source. The most appropriate place for most people will be in the restroom, although it also requires an electrical plug-in. Laundry rooms are also a good space for hooking the CatGenie up. Once it is all hooked up, the waste is flushed by using water and cat-safe, veterinarian-approved SaniSolution. It also washes, scrubs, scours and purifies the washable granules and cat area clean and ready to use again. When it is flushed, simply put the tubing underneath your own toilet bowl seat, or insert the GenieHose into the washing machine drain pipe to flush the waste away for good. There is absolutely no scooping required. The washable granules that replaces your cat’s litter is perhaps the most unique feature of the CatGenie. It looks like and feels like actual cat litter, which will satisfy your cat’s natural need to dig and cover. The rule of thumb for owners of multiple cats is to have one litter box per cat, plus one extra box. This can take up a lot of space, not to mention a lot of time to clean each individual box. With the CatGenie, since the box can be cleaned so quickly and easily, just the one product per three cats should suffice. The washable granules will last you quite a while. 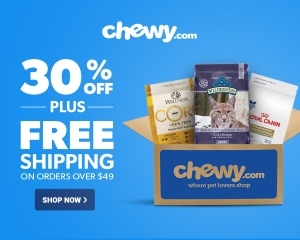 Specifically, supplies should last 2-3 months for one cat and about two months for two cats, although there is some variation depending on the behavior of your cat(s). Replacements for the granules typically last up to 240 flushes and cost approximately $22.00 on Amazon. For most people, this will save money on your cat clean-up. If you or house guests are bothered by the smell of cat litter, not to worry–the washable granules that come with the CatGenie are odor free. It is also dust free, unlike normal cat litter, and is 100% septic safe, so you don’t have to worry about what it will do to your septic system when it is flushed into it. The plastic in the SaniSolution Cartridge is recyclable, unlike normal cat litter. Each cartridge holds 120 washes or more and when set on Cat Activation mode, it provides 240 washes. A year supply of Cartridges takes up less space and uses less plastic than one container or one month’s supply of cat litter, making the CatGenie a green product. There are several ways to program the CatGenie. You can either preset your CatGenie to run automatically up to four times daily, press the start button whenever you wish, or set it to Cat Activation Mode. In Cat Activation Mode, the washable granules will last longer, although you should experiment and see what works best for you and your cats. CatGenie says that it requires only “easy DIY set-up,” but since there is a bit of fussing with tubes and requires a wrench, a pair of pliers, it depends a bit on how handy you consider yourself to be. Most daunting though, is that some non-standard hookups may require additional parts that are not provided in the CatGenie packaging. If you have a rigid water line in your bathroom, you may need to replace it with a flexible one also. If you are having a hard time picturing how the CatGenie works, the instructions thankfully come with diagrams. Imagine a pipe coming from the system and hanging into your toilet bowl. The waste is ground up into smaller, flushable pieces, and then sent through the pipe. It ends up in the toilet bowl along with the waste water. If you decide to hook the CatGenie up to your washing machine drainage, it gets flushed into the same place that the waste water from the washer goes. Both scenarios are pictured in the diagram with the instructions. Tubes are lengthy but can be cut down to the size needed. While all of this may be considered an easy set-up for CatGenie, the truth is that for many people, this can be a bit of a daunting task, especially when compared to similar products. While the CatGenie’s features are unique and varied, the price is more than twice of what a typical self-cleaning litter box usually costs. This alone will turn some buyers away, even if they are intrigued with all that CatGenie has to offer. Your cat may like its warmth a little too much! At the end of a cleaning cycle, the CatGenie dries the washable granules clean with a warm dryer, leaving the litter area a nice inviting place for your kitty to relax, especially if she likes sitting in a warm place, like a windowsill or laundry that is fresh out of the dryer. The problem with this, is that this keeps the Cat Activation mode always on, which will be wasteful. In this case, another setting will work better for you, but it is something to be aware of. Because a whole cleaning cycle takes about 30-40 minutes, this means that your cats cannot re-enter the CatGenie, and if you own more than one cat and they are waiting in line for their turn to use the facilities, this could create a bit of a problem. As with anything, depending on how your cat(s) behave, this may be a problem or may not be an issue at all. CatGenie comes with a two year warranty, which is longer than standard self-cleaning litter box and should also put some buyers’ minds at ease if all that the CatGenie promises cat owners seems a little too good to be true, or if you find that some of the pieces that are necessary to make the CatGenie function properly will not work with your particular set-up. The CatGenie Self Washing Self Flushing Litter Box will work well for many cat owners who are looking to make their pet clean-up duty as self-automated, hands-off and easy as possible. Along with the tantalizing prospect of not having to fuss with cat litter ever again, the washable granules are also an invention that many people will be intrigued by and pleased with. Still, there are a few things here and there that make the CatGenie a perhaps questionable sell for some cat owners, depending on the particular quirks of your own cats and if you have a set-up that will work with the system required of the CatGenie. And while the price of the CatGenie is fair, considering all it has to off, it can still be a lot of money to put up front for a number of prospective buyers. Still, the CatGenie may just be the self-cleaning litter box to end all self-cleaning litter boxes for a number of cat owners, making it well worth it’s market price in the end. Along with the two year warranty that it comes with, the CatGenie is sure to make some cat owners, and their feline friends, quite happy, satisfied customers.